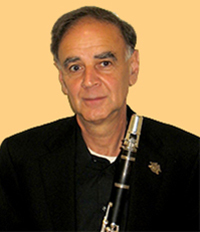 Phillip Bashor has been principal clarinetist of the Greenwich Symphony since 1989. Awarded a full scholarship at the New England Conservatory, he studied clarinet with Harold Wright, and chamber music with Rudolph Kolisch and Gunther Schuller. At the age of nineteen he played principal clarinet for Leonard Bernstein’s “Mass” at the opening of the Kennedy Center in Washington, D.C. Mr. Bashor has been principal clarinet with the Brooklyn Philharmonic, New Haven and New Jersey Symphonies, Amor Artis, and the Kansas City Philharmonic. He has recorded the for Phillips, Columbia, Sony, and BMG labels. With the Lumina String Quartet, he premiered several new compositions at international festivals, including Rashid Kalimullin’s “Fantasy for Clarinet,” which was broadcast throughout Russia.